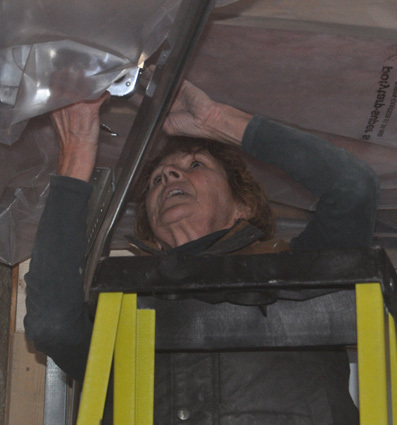 Carolyn Smith staples vapour barrier into place in the rafters of the new barn at the Sandy Pines Wildlife Centre Saturday afternoon. Photo by Adam Bramburger. Inside the newly built barn structure toward the back of the Sandy Pines Wildlife Centre, electric saws whirred, wooden chips flew and progress happened. Volunteers from Graham Construction and the Friends of Sandy Pines gathered for an old-fashioned work party Saturday. As the rain fell outdoors, a small, but dedicated crew worked on finishing the job. Jason Bonter, Graham’s construction manager was cutting out pieces of wooden trim and teaching crew members how to fit them into place. On a ladders overhead, project manager Ryan DeJonge was pushing insulation into place as Carolyn Smith and Linda Garrard spread and stapled a plastic tarp that will serve as vapour barrier. Outdoors the crew managed to get a series of holes dug for a fenced-in area before the weather turned miserable. According to Bonter, much of the work on fitting the structure has taken place on weekends. He said the project is a labour of love to give back to a community that has been supportive of the company as it builds a multimillion-dollar dairy plant in the area. Bonter says he’s enjoyed the opportunity to get out of the office into the fresh air and work with his hands again building. “It’s also a good experience to do team building with our own group,” he said. Bonter said the Friends of Sandy Pines volunteers were a big help in getting tasks done on time. Smith said she volunteers with animal care at the centre weekly and, knowing the need to get waterfowl and other animals inside after a fire destroyed an exisiting barn in January, she wanted to do her part. “I knew this was needing some help,” she said. Bonter said there may be further opportunity for volunteer help in the future.